Eternal Orthodox Church calendar for the 13.06 year 2017. One of the Seventy, he is mentioned in the Epistle of St Paul to the Romans (16:14). A Greek by birth, he spent a long time in Rome. 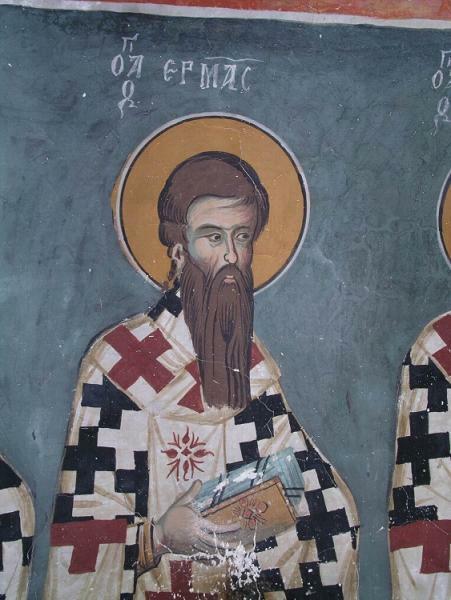 He was bishop in Philippoupolis, and finished his life a martyr. He compiled the very instructive book 'The Shepherd' through revelations from the angels of God. Hermas was a rich man, but fell into extreme poverty through his own sins and those of his sons. A man appeared to him, clad in white and with a staff in his hand, and told him that he was the angel of repentance, sent to him before the end of his life. The angel gave him twelve commandments: 1. To believe in God. 2. To live in simplicity and innocence. 3. To love truth and flee from falsehood. 4. To guard his thoughts in chastity. 5. To learn patience and magnanimity of soul. 6. To know that a good and an evil spirit attend every man. 7. To fear God, but not the devil 8. To perform every good deed and to restrain himself from every evil one. 9. To pray to God in faith from the depths of his heart, so that his prayer might be heard. 10. To preserve himself from melancholy, the daughter of doubt, and from anger. 11. To try true and false prophecies. 12. To preserve himself from every evil desire. He was a soldier in the imperial army till old age, when he suffered for another Emperor: Christ. The wicked judge tried in vain to make him renounce the Christian faith and offer sacrifice to idols, then he ordered that Hermias"s teeth be broken with a stone and the skin stripped from his face with a knife. After that, he was thrown into a flaming furnace, but he remained unharmed, protected by the grace of God. He was then made to drink the strongest poison, which was given to him y a magician on the judge"s orders, but the poison did him no harm at all. When the magician saw this, he was so amazed that he confessed Christ himself, and was immediately slain with the sword. They then poked out both of Hermias"s eyes, and he said mildly to the judge: "Take the eyes of flesh which used to gaze upon the vanity of the world; I have other eyes in my heart with which I clearly see the true light." He was then hung upside down by the feet, and those who were torturing him became blind and staggered around him. St Hermias called them to himself, laid his hands upon them and restored their sight by his prayers. Seeing all this, the judge became as furious as a lion and, drawing out his sword, cut off the head of the man of God. Christians came and took Hermias"s body in secret, and gave it burial. His relics gave healing to all the sick and wretched. St Hermias suffered in the reign of the Emperor Antoninus, in the year 160. This martyr of Christ"s was born near Alexandria. During a persecution of Christians, Philosophus refused to renounce Christ the Lord before the pagan princes and judges, and they therefore inflicted terrible tortures on him. After he had been tortured in various ways, they finally placed him on a soft bed, bound hand and foot, and put a harlot in with him to entice him into sin. When Philosophus felt passion awakening in himself through the touch of the woman"s hands, he took the tongue between his teeth, bit it through and spat it out in the harlot"s face. His passion was extinguished and the harlot was so aghast that she fled from him at once. He was afterwards beheaded with the sword, in about 252, whilst still young in years, and entered into the Kingdom of eternal youth. (In the Greek Prologue, St Philosophus is commemorated on May 1st.). He was converted on witnessing the martyrdom of Hermias. 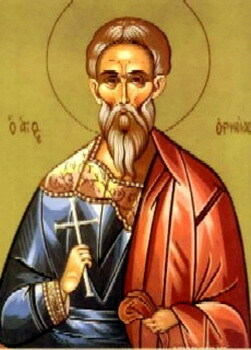 The Holy Martyr Magus (Magician-Sorcerer) suffered together with the Martyr Hermias during the persecution under the emperor Antoninus Pius (138-161).